Romping and Rolling in the Rockies: My Christmas Present - Mountain Lion Kittens! My Christmas Present - Mountain Lion Kittens! 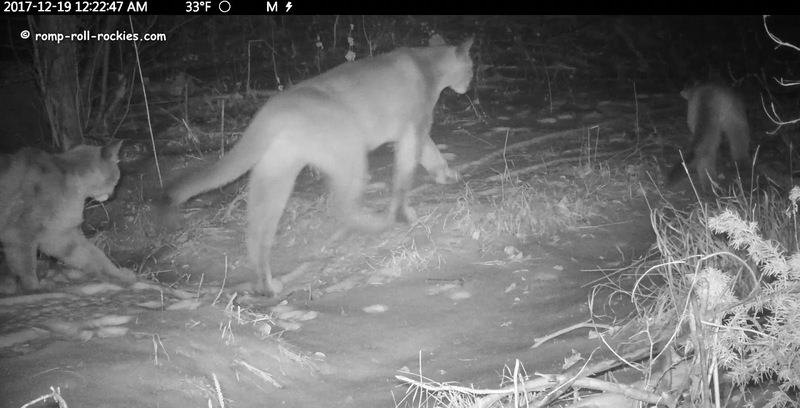 In the week before Christmas, a mother mountain lion entered our area with her kittens. I first was aware that a lion family was among us based on the tracks that they left. Three sets of huge wide cat tracks walked parallel to each other. I worried a little as I observed that the tracks went within a short distance of a pen holding goats. The lions left the goats alone. Phew. 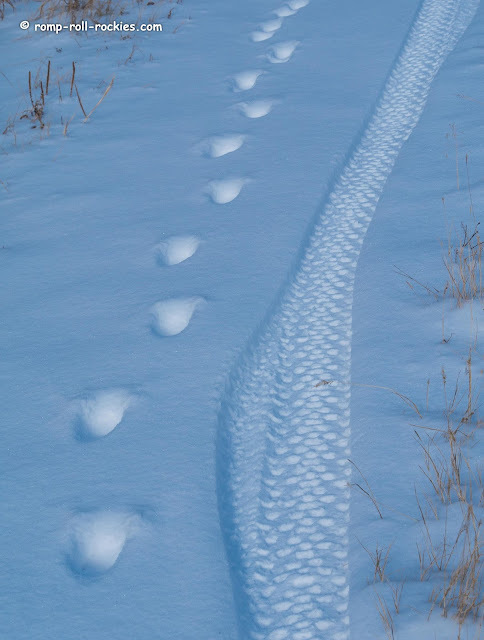 For a little while, a kitten's tracks paralleled my fat bike tracks. I love that sight! As the family entered our neck of the woods, a kitten appeared first. This was the same site where a mountain lion stalked prey a couple of weeks ago. Mom and the second kitten were next in line. The second kitten lingered in front of the cam, letting us see that he still has spots. He's on the young side - maybe 4 months old. That's a wild guess. 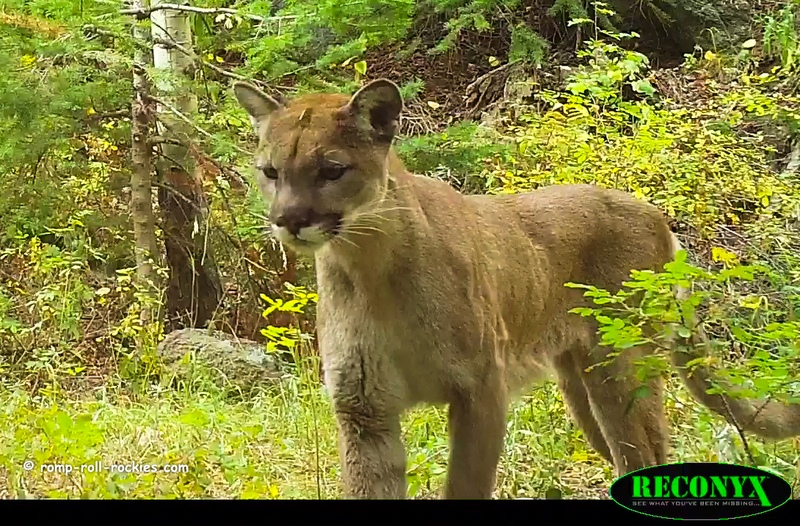 This sighting made me go back to see what other mountain lion kittens my cams have recorded this year. All the other kittens were older than these ones. This one repeatedly followed an identical path down below my trail cam in September, as if there was a den down there. I show the footage from his visits in the video below. And this kitten was traveling with his mother and sibling, visible in the background in June. He was a mature kitten, probably approaching the stage of life when he would strike out on his own. You'll see in the video below that he was almost as big as his mother in June. 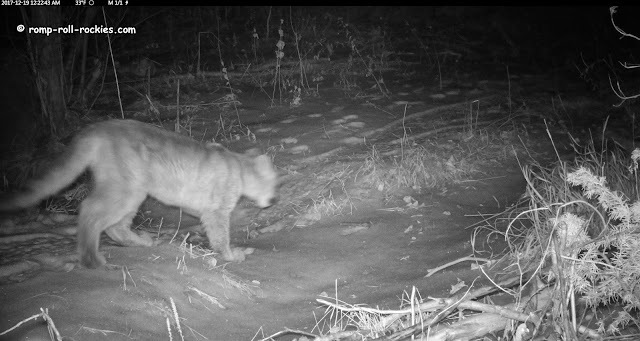 Those were all of the mountain lion kitten sightings from 2017. 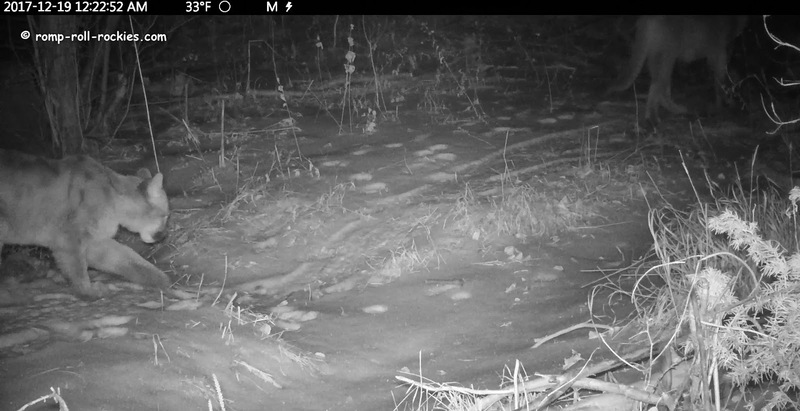 It may not seem like much but my cams don't see any lion kittens some years. I compiled the video clips into a short video that you can watch here or at Youtube. I hope that you enjoyed that little "tour of our mountain lion kittens"! Might be my fav Christmas goift this year! Thanks for sharing those beautiful animals. Ah, Yes we did enjoy the clip. up close is a gift. Can wait to see more drone clips too. background music we enjoy it all. I loved it! I hope you had a great holiday! Well this is my best Christmas present - thank you, KB! That's amazing. They are so cute. I suppose they will have to go far to find a mate when the time comes. They are such beautiful sweeties! You know we always love seeing the wildlife in your area,and your videos and photos are spectacular. We hope you all had a wonderful Christmas Day. A wonderful gift from your mountain lions. Hope you had a super day and enjoyed the snow, the cold, and the cosy indoors. Great photos as usual! Love the track/bike photo! Your cameras are always in the right place at the right time! So interesting. KB,, your photos are spectacular... Whenever we look at them.. its just like living in the wild!. So much beauty,,, so much beautiful nature! Loved all the photos! Sweet little ones. What a wonderful surprise! We are in awe of the beautiful nature that surrounds you. Oh my GOODNESS!!! That is so special! They are gorgeous!!! What a gift indeed!!! What a wonderful sighting...the perfect Christmas gift! What a special present, they are truly beautiful. 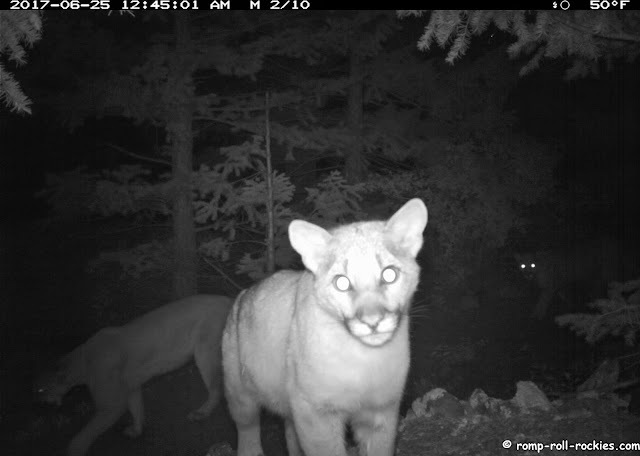 Most of our mountain lions live in the mountains above the west side of our valley, where there are deer. Our canyon is to the east and they are probably here too, but at higher altitudes. Or so I hope as I'm not as brave as you and wouldn't want to run into one. What a great Christmas present for all of us. I want to thank you again for all the trail cams you maintain and all the time you spend sorting through all the footage you get. It's always so wonderful to get a glimpse into the hidden gems you find in your neck of the woods. Wahoo!! Such a great Christmas present! That B&W look right at the camera by the kitten is simply adorable. Wow so wonderful. What a privilege it is for us, via your trailcams, to see these creatures. Thankful Thursday - Don't Worry about "Udders"